Ice compartment holds up to 5 lbs. Keep your crawlers, leeches and live bait lively and active no matter what the temperature is outside. 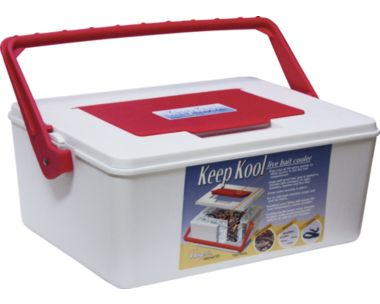 The secret to this innovative cooler is the 1-5/8" ice chamber that surrounds the entire bait compartment. This chamber holds up to 5 lbs. of ice and is insulated with foam core to maintain the bait temperature at 38-44° for hours. Easy pop-up lid for quick bait access. Large, sealed, spillproof bait compartment measures 8 7/8''L x 5''W x 5''D. Locking handle keeps cover secured while accessing the bait and unlocks to refill the ice chamber.